I saw Peter Keelty's Review of this ski and I was modestly intrigued. I went to the company's website and I got a lot more intrigued. 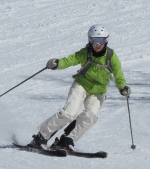 It is very difficult to find wide skis with tight turn radii. There are a lot of reasons for this but for a skier that wants to put the ski on edge as much as possible, having a tight turn radius helps a ton. It definitley is a more of a PMTS thing, but that is how I ski. These skis are 101mm underfoot and have a 15m turn radius even in the 188 length. I sent the owner an email and this is what I know about the skis, it's a race laminate sandwich construction ski which uses both carbon fiber and fiberglass. This means it will have a lighter feel. It's a twn tip and the 188 length appears to ski pretty short. Dims are 150-101-134 in the 188 and it weighs 4600g. 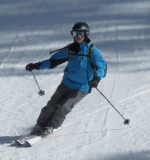 Skis have traditional camber and no rocker. Demos are readily available in the Summit County area. This is the ski I have been looking for at least as far as dimensions. I know nothing else about this company or these skis, other than that Peter gives it an excellent review. I'm not sure what I will do. If anyone skis on a pair of these please post comments (or if anyone knows anything more about skilogik or these skis). I may demo a pair when I go to Col in November. I have nothing to add to this-but wanted to say I went through the same process as you (from peter's review--especially with the listed turn radius-, to the website, to exoticski review, to emailing the owner). It's the first over 100mm waist ski I've seen get those kind of reviews on peter's website. I'd love to here more bout this ski. Just a heads-up that, for $50 extra, they will personalize the top sheet with your name. I'm also very impressed with corporate culture and the commitment to their people. Why do you say the skis ski short? They aren't twin tips or rockered?? And the lady with the crystal ball is very right, I am VERY intrigued. If you look at the picture of these on their website they look like twin tips. There is no flat tail, it's rounded and the front and back look almost identical. I feel pretty confident from this and from his response (where he did not say that I was wrong with my assumption) that these are twin tips. But I have been wrong before. I saw these in Denver last year and they are beautiful skis. I was > < close to coming home with a pair. Makes me almost think now that I should have. Just to add a bit more fuel to the building inferno.? The following is from Peter responding to my request to compare the Watea 84 and Ullr's Chariot.? John, remember that Peter and I are both one size shorter than you are.? Sounds like he plans to put some of his money on a new pair. For sale! 1 pair of Watea 84's. The Chariot is definitely more versatile overall. In fact, and I'm going from memory here--I skied them for a day last April--I would go as far as to suggest they out carve the 84 except on actual New England ice. We skied on a day at Solitude in which we encountered everything possible, from frozen morning crust to late afternoon almost-slush with nary a balk or problem. FWIW, my plan is to make the Chariot the "other" ski to complement my 4X4's. Thanks Jim, I enjoy spending money on skis and you and everyone else is making it oh so easy. I will also tell you why I like the 188 better than the 178. Usually when you go up in length by 10cms you usually get a corresponding uptick in TR. Usually when you have a 15m TR ski in a 178 the 188 will be 17m. Dave has done something really nice with the Chraiot in that he increased the tip size on the longer ski, creating more sidecut and hence keeping the TR at 15. I also think in 3d snow (powder) the wider tip will also float a little better. If I was going to use this ski as a wide "daily driver" I might consider it in the 178m (although knowing the running length it is even short for that). However for me, if there isn't a good amount of fresh snow, I own so many other skis that I would rather be on so I know I will only pull this out when i's fresh and soft. My guess is that I will be on 3-4 skis this year mostly. The new Head SS's with KERS on groomer days. Head IM 78's skiing off piste without fresh snow, the chariot for fresh snow, and the Head ICON TT 80's for bumps (really a great bump ski).? I will also say that I do love my K2 Hardside skis for pow as well and I will have to do the side by side comparison against the Chariot. The chariot has one big advantage, that tight turn radius means that you can use the sidecut more, pivot less and actaully work a lot less in the pow. Should be a nice leg saver. Can't wait to try them (haven't bought them yet either). I sold a lot of skis last year which was pretty much my first time doing that ever (I learned alot watching Ron!!). I ended up with a $2400 balance at Paypal. I feel like I am fully loaded with ammo for the upcoming ski buying season. I also don't want to buy a zillion skis this year like I always do. I already have an awesome quiver. Let's see how patience sits with me. Clearly not my strong suit!! Sounds a lot like you may have "figuratively" bought the ski, even if you haven't yet "literally" pulled the PayPal trigger!? ? My logic. I only have two pair of skis, the SuperShape Magnums and Watea 84's (soon to be replaced? ), and I"m looking at the UC as a western 1-ski quiver with more float than the Wateas without giving up anything on groomed (and turn radius is less).? ?Since i'm not likely able to demo, since we all know that sometimes there are differences between lengths of the same ski, since I'm wowed by its alleged versatility, and since mid 170's is what I would normally pick anyway, the fact that the 178 is what the reviews are based on makes the 178 a safer choice for me. And yes, it is a twintip. And, even more important, it has Peter's green icon which is what works for me. Jim, I'm not sure how many 100m waisted skis you have been on but I will tell you in advance that just by the size of the waist they are much harder to get on edge and to get high/deep edge angles with. It's also very easy to dig the inside ski while carving when the waist is that wide. The Chariot has that tight turn radius which will make edge lock carving tight turns possible, IMO it will still require a lot of work, balance and precision. The reward for this may be an incredible do everything ski, but I wanted to warn you in advance. Even though this ski has a 15m TR it is still 100m underfoot and the ski will be cumbersome. The dream of that perfect one ski quiver lingers, but a reality check tell us that if you want to carve tight turns with high edge angles get on a 66mm waisted ski with 12m TR. Having said all that I am dying to see how the Chariots ski on hard snow. My guess is that they will be the best 100mm ski either of us have ever skied on groomed terrain. Or at least I hope so!! Points well taken. ?Physics is still physics, and the lever arm from the center of the boot to the edge of the ski increased another 8mm, so I am giving up something. In fact I see the fact that they "ski short" as a plus on the groomers, and I don't ski as well as you or generate the edge angles that you do. On those rare days when there is truly hard snow in Colorado/Utah I will rent something. ?Even the Watea's have left my ankles aching at the end of the day a couple of times, but I can't remember many days like that (maybe a couple last year). ?I had many more days when the flotation Lynn was getting with her 84mm waisted Muangas (Zeal) made it much easier for her to navigate the trees or whereever we were, places where I was thinking that it would be nice to have a wider ski (if it weren't a boat). ?Anytime you seek versatility, you give up utility somewhere, but I am backing away from the "thrill" of lugging around 2 pair of skis. ? But I am intrigued by Peter's description that "maybe they've created the ski that couldn't be done" and I'm reassured that the groomed snow skiing won't be any worse than with the Wateas. ?In fact, a case could be made that they will turn as well as the Watea's (18m TR) at lesser edge angles because the shovel will engage earlier. I was talking with Lynn earlier and decided that maybe I should personalize them with my Epic login name rather than my real name. ?Makes them distinct and easily identifiable if necessary, but not much stigma if reselling becomes desired. ?That should be a trend, would love to see "dawgcatching" or "carver" or "wearsthe foxhat" or some of the other distinctive names on a pair of skis, for example.